Spectral analysis of diamonds reveals their their near-infrared signature. Twinklingstars are often compared with diamonds, sparkling and bright. Stars are madealmost entirely of hydrogen and helium with traces of other elements; diamondsare made of carbon. However, there are real diamonds in the sky, and theyderive from the fiery furnaces that make stars shine. As stars fuse lighterelements, releasing energy, carbon is produced along with other elements vianuclear fusion. Eventually, a portion of these elements is released into theinterstellar medium when stars die. Astronomers find carbon compoundsthroughout the interstellar medium including diamonds, the most compressed formof carbon. How do we know that there are diamonds in the sky? By comparing theastronomical spectra with laboratory spectra and calculated models of emissionand absorption spectra. Interstellarmicrodiamonds are found in meteoroids called carbonaceous chondrites. Think of these diamonds as "diamond dust," not jewels that could gracean engagement ring. We can detect the fingerprints of diamonds by looking attheir near-infrared signature via spectral analysis. What we see is theevidence of carbon atoms emitting or absorbing infrared energy as their bondsstretch, twist and flex. While only a few astronomical objects, such as HD97048 and Elias 1, show spectroscopic features in the 3.4 – 3.5µm emission region that can be assigned to microdiamonds, as shown ina) and b) respectively (see figure at right), many astronomical objects, such as dense clouds,exhibit an interstellar absorption band (shown in red in c) which peaks atabout 3.47 µm and is superposed on the long wavelength wing of the3µm H2O ice band. This feature has been tentativelyattributed to the tertiary C-H stretch of diamond-like carbon. Part of thedifficulty associated with tracking interstellar microdiamonds stems from thelimited knowledge of their infrared and electronic properties. Theoreticalcalculations can help us understand the possible contribution diamondoids maketo the chemistry and physics of the interstellar medium. Diamondsare tightly bound chemically, and it takes considerable energy to cause them toemit a characteristic spectral "fingerprint." Modeling helps us tounderstand what we might see in the presence of a very energetic star. Ourcomputed spectroscopic properties imply that, if diamondoids are present inthese astronomical environments, the majority would be in the neutral form. Thecombination of small absorption strengths (f-values) and largeexcitation energies, which are close to the ionization energies, makes itunlikely that, as a class, neutral diamondoids can become sufficiently excitedto emit strongly in the infrared in most astronomical environments. 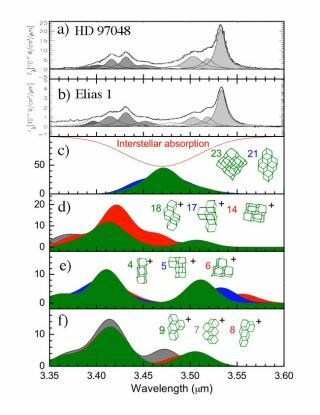 Thus, ifneutral diamondoids are abundant in the interstellar medium, theirspectroscopic properties favor detection by absorption in the 3 µmregion rather than emission. As shown in the figure, neutral diamondoids willabsorb most strongly near 3.47 µm. Our computed infrared spectra fortwo neutral diamondoids (green and blue peaks shown in c) are centered around3.47 µm and line up with the interstellar absorption band associatedwith dense clouds. This result supports the assignment of the interstellar 3.47µm absorption band to neutral diamondoids. Using the calculatedabsorption/emission band for diamondoids, we can interpret astronomicalobservations. The verysmall absorption strengths of both neutral and ionized diamondoids place tightconstraints on the astronomical environments in which they can becomesufficiently excited to emit strongly in the infrared. Clear-cut infraredfluorescent emission from highly vibrationally excited diamondoids requiresradiation fields with both high energy and high flux. For diamondoids largerthan those shown in c), the C-H stretching band shifts into agreement with theemission bands of HD 97048 and Elias 1. However, radiation fields strong enoughto excite the neutral diamondoids will also produce ionized diamondoids. Ourcomputed infrared spectra for small positively charged diamondoids, shown in d)-f), line up with parts of the emission spectra for HD 97048 and Elias 1 andsuggest that the rare 3.5 µm interstellar emission feature originatesvery close to the exciting star and strongly support its assignment in HD 97048and Elias 1 to diamondoids species. We also show that neutral and cationicdiamondoids can contribute to the observed emission features. There arediamonds in the sky that reveal themselves when excited by the glow of brilliantstars.